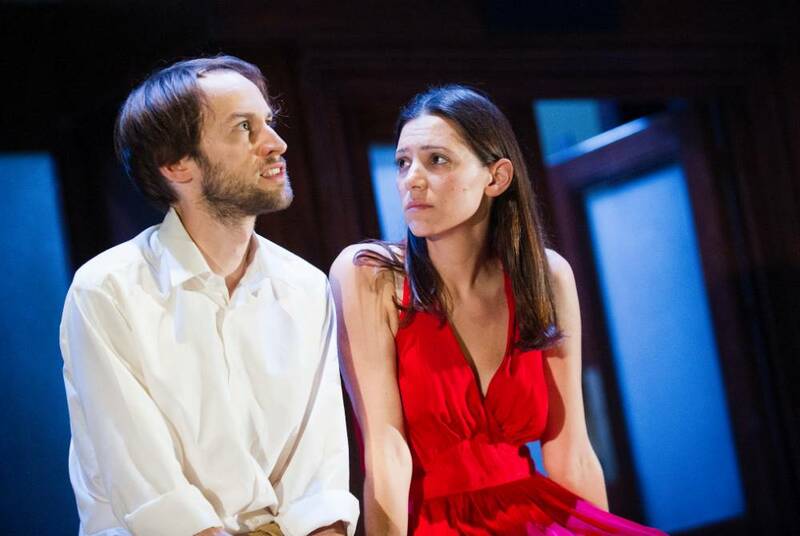 Robert Icke and Duncan Macmillan’s exciting production of George Orwell’s 1984 (they did the adaptation as well as directing it) began two years ago at the Nottingham Playhouse and toured around the U.K. before opening at the Almeida in London and subsequently the West End earlier this year. (It will tour the U.S. this fall, including a stop at the American Repertory Theatre in Cambridge.) Orwell’s 1949 classic is inherently dramatic, though both movie versions – one in 1956 and a second, naturally, in 1984 – were disappointments. (A 1953 television production for CBS's Studio One attracted some notice, but I’ve never seen it.) 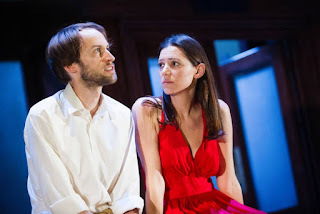 Icke and Macmillan’s 1984 is relatively modest, though the stagecraft in the climactic scene where the Thought Police arrest Winston (Matthew Spencer) and his lover Julia (Janine Harouni) is quite sophisticated. The show has a cast of nine and Chloe Lamford’s set, which looks like a slightly moldy English library from the Depression era, also does service as an office, an apartment and a canteen; it manages to both look anonymous and suggest a nostalgic glimpse of an earlier England. Icke and Macmillan give the material a somewhat tricky frame: a book club discusses 1984 – not as a book by George Orwell, but as a journal written by Winston Smith, Orwell’s protagonist, during the years when the Party till held sway over England. (It was disbanded years ago, we’re told.) This narrative addendum doesn’t really enhance the material. It wouldn’t even if it didn’t hold onto the old realist convention of the found manuscript that eighteenth- and nineteenth-century writers so prized, but at least it would seem less convoluted if the book club were debating how many of Orwell’s inventions were true of contemporary society rather than how many of the observations of a fictional character are still with us. Still, the introduction of the club has an eerie, surrealist feel. 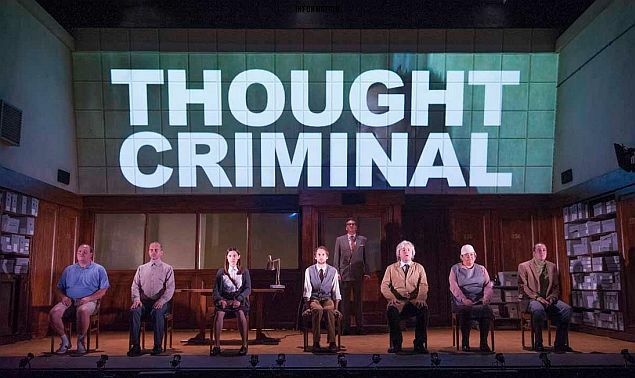 The play begins with Winston writing some initial thoughts about his fascist society while we see his words projected onto a screen above the set – a clever touch, since his voice-over tells us that one never knows when the Thought Police are watching you. Then the stage plunges into darkness, and when the lights come on again the literary club is sitting around a library table while Winston appears to be listening. We don’t know at first whether the directors have simply juxtaposed two stage images or whether Spencer is now playing a member of the club (it turns out to be the latter), but the effect is unsettling. Even more unsettling is the presence of a Winston look-alike (Christopher Patrick Nolan) at the stage right end of the table, across the stage from Spencer. Later Nolan takes on the role of Martin, assistant to O’Brien (Tim Dutton), the higher-up in the government office where Winston and Julia work who recruits them for the rebellion against Big Brother and then has them arrested. The mirror image created by the casting of Spencer and Nolan works visually in tandem with the screen and the befogged window upstage right that a “prole” woman (Mandi Symonds) repeatedly washes but that never seems to get any cleaner. All three of these elements suggest the idea that Big Brother is always watching – behind a window, through a screen, even (and this is an invention of the production) when Winston sees his own image staring back at him. Spencer’s face is bland yet expressive; he looks like a comic-strip character, a stick figure with a high brow and peeled eyes. Most of the play is from his point of view, so the visual notion of the character as a kind of bewildered everyman figure, distanced from what he sees, not unlike a silent comedian like Chaplin or Harry Langdon, is oddly appropriate. In the office cafeteria, his co-worker Syme (Ben Porter) proselytizes about the virtues of newspeak, the compound-heavy language of the Party, and Winston stares at him as if he were an automaton, and eventually Syme’s voice slows down like a worn machine in brown-out mode. Nolan also plays the canteen worker who sells Victory Gin from a trolley in the cafeteria and cleans a piece of silverware compulsively, again like a slightly malfunctioning machine. Fragments of scenes are repeated like tapes being run over again; the déjà vu effect adds to the feeling that Winston walks through the world as if he were in a nightmare, convinced that his perceptions are accurate – that two plus two equals four – yet having to question his own sanity because what he thinks is so radically at odds with what the Party is force-feeding him. When Winston and Julia find a romantic hideaway in a room he rents behind an antique shop, their scenes in bed are on film, projected onto the screen. These cinematic interludes feel more intimate, like old movies viewed on a worn, crummy old screen (close-ups always make movies feel more intimate than scenes played out on a stage), while at the same time the screen underlines the impossibility of privacy in this society. When the Thought Police invade this modest paradise, they pull the set apart, exposing a much larger screen upstage, and suddenly we see the room as we’ve never seen it before, as a box set. This is a great moment. Unfortunately what follows is less inspired. The scene where, under O’Brien’s supervision, Winston is tortured in the much-feared Room 101 goes on far too long, and it’s static; it feels as if this section of Orwell’s book had simply been lifted onto the stage rather than dramatized. It’s too bad that this production of 1984 doesn’t have a stronger ending, but overall it’s a smart, provocative show.